With Thanksgiving upon us, I’ve been thinking about some of the things I’m most thankful for. All of us, no matter how fantastic or awful our lives may be have much to be thankful for. Even though the backstory of this holiday with the turkeys and Indians and all that jazz is a bit politically incorrect these days, it’s still a great time to be with friends and family. And, more importantly, plan trips to Best Buy at 3am for a $199 HD TV that will probably be both outdated and broken by New Years Eve. My little family and a new friend. · My son, The Little Dude. He is the reason I get up in the morning & I don’t just mean because he climbs on me while I sleep. He has an infectious laugh, fantastic curls and his mother’s patient personality. And people say he looks like me, which doesn’t hurt his case. · My wife, The Dudette. Her willingness to go above and beyond the call of duty, including while changing all types of doody, really set her apart as a person, wife & mother. And her banana bread could bring the Pope to tears. · The rest of my family. All terrific, no matter the situation. Life hasn’t always been a piece of cake for us, and from the look of us you can tell we’ve obviously eaten our share of cakes. Through good and bad, we have survived. Much like Gloria Gaynor, but actually quite different. · Five Guys Hamburgers. Having lived for 12 years in a city where In’N’Out is hailed as the second coming, it’s nice to have a place that actually makes good food hit the west coast. And extra thanks to Five Guys for not opening too close to where I live, or else I might weigh 500 pounds. 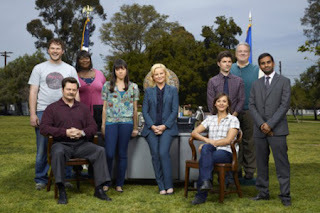 · Parks and Recreation. The funniest show on TV always brings a smile to my face, no matter the mood or how late at night I watch it. Bonus thanks to Nick Offerman’s mustache and Jim O’Heir’s sweaters for pretty accurately reminding me of life growing up in the Midwest even though the show films 2500 miles away from there, coincidentally just a few miles from where I now live. · Los Angeles Traffic. Though I completely despise you, you make a great excuse for being late that is always accepted unconditionally by other locals. Even if you are stuck on the 405 for 3 hours at 2am on a Wednesday people don’t flinch when you tell them, for they have their own war stories to share of the 101 gone wrong. · Southern California Weather. You can wear a t-shirt and shorts outside in most places in the US during July. (Except San Francisco.) It’s great living in a place where you can do the same in January. · iPhone 4S. Though I was reluctant to get it, kudos to my wife for both pushing me into it and buying it for my birthday and Hannukah gifts. For the next 3 years. · Diet Mountain Dew. Without you, I would probably fall asleep at 9:30 every night and this blog wouldn’t exist. Also, my bloodstream would contain a lot less aspartame. · The Penn State Scandal. While what happened is obviously horrible, it has made the misdeeds by those at my alma mater seem much more palatable in context. And last, but not least, I’m thankful for all of you who take time to procrastinate at work and read this blog. Sometimes I wonder if anyone actually reads what I write and then you surprise me with great comments and emails. I’m very thankful for those of you who have told your friends about me. It’s your support that keeps me going. Cash helps, too. Sincerely wishing you a very Happy Thanksgiving! Happy Thanksgiving to all of you!! Hope you're enjoying your time in Ohio! Hey Dude. Thanks for the inclusion in a really sweet column. Have a fantastic holiday season. @Jenni, Thank you. Hope you had a great one, too. @Jim: Thanks, same to you as well! looking forward to seeing you on the non-tube/tube again soon.